The truth is, starting a sentence in an engaging manner can be difficult sometimes. This is also true when it comes to finding the perfect words or phrases to connect ideas. Once you get good grasp of evidence sentence starters, transitional words, and essaychecker a reader will find your paper or essay irresistible from the beginning. It aids you to come up with more nuanced and richer ideas, instead of the regular habit of creating simple subject-verb sentence structure. When you use transitions and good starting words, you are able to link the ideas in your essays more effectively. These well-selected words make your academic and other papers sound more credible as well as professional. As mentioned earlier, well chosen concluding sentence starters will keep your reader engaged and curious about what you are about to say next, rather than being easily predicted. Your writing will stand out from the pack if it uses transitional and linking words effectively at every necessary point. Your ideas and concepts are more coherent when you use transition sentence starters. How Do You Use Sentence Starter Lists? In order to improve your writing in the quickest possible manner, there are some proven funny English grammar rules you should keep in mind and adhere to. The major rule is to recognize the different purposes of transition words and sentence starters. If you’re explaining steps in a process such as steps required to carry out titration in a science laboratory, you would be better off using transition words for introducing the steps. Word starters and transition words are also useful in narrating something that happened. In this case, you should use the appropriate transition words for this purpose. Some words are indeed notable for being good sentence starters. The list will include the following: although, I would like to, first, meanwhile, therefore, subsequently, while, I would like to, moreover, in general, in addition, furthermore. Good writers do not just end their essays or writings abruptly. 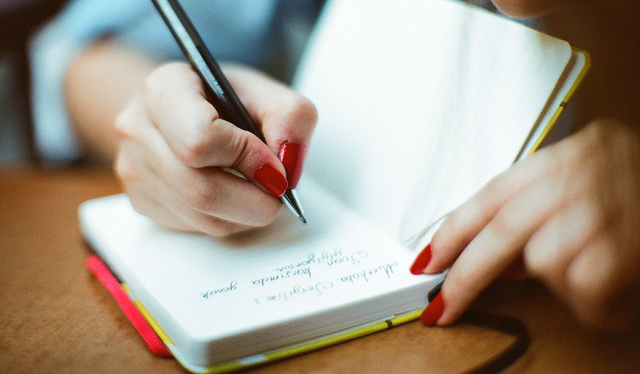 Whether you are concluding an idea, concept, paragraph or the entire writing, using transition words that denote conclusion shows you are well organized and professional. It also portrays that you have good grasp of the academic language. To give examples: For example, for instance, as an illustration of, to illustrate this, here’s an instance, such as, exemplifies, shows, demonstrates that…and so on. To show prior or background ideas: Historically, in the past, customarily, over time, at first, primarily, originally, formally, prior to, previously…and so on. Time connectives: Lastly, finally, afterwards, after a while, following that, next, subsequently, to begin with, before long…and so on. Making emphasis: Emphatically, in essence, again, as a highlight, as an emphasis, to lay emphasis, it is important to state that, essentially, in reiterating this point…and so on. One of the tricks is to consider how a sentence fits with the previous one. You should also consider if the sentence is adding information, making emphasis, explaining a process, stating examples, or narrating a past event. If the sentence is intended for commentary, then use commentary sentence starters. Now, it is important to mention this; avoid repeating transition words. Each purpose has tons of words you can choose from. So, avoid making your writing boring by excessively repeating sentence starters or transition words in your paper or essay. Also, remember to place a comma after a transition word, followed by the subject. The key vocabulary or terminologies of your essay should not be played down as well. And, you should integrate signal words when necessary. Finally, it is highly recommended that you take advantage of professional writing help to make your essay generally engaging and irresistible to the admission committee, not only in using good sentence starters, but in all aspects. 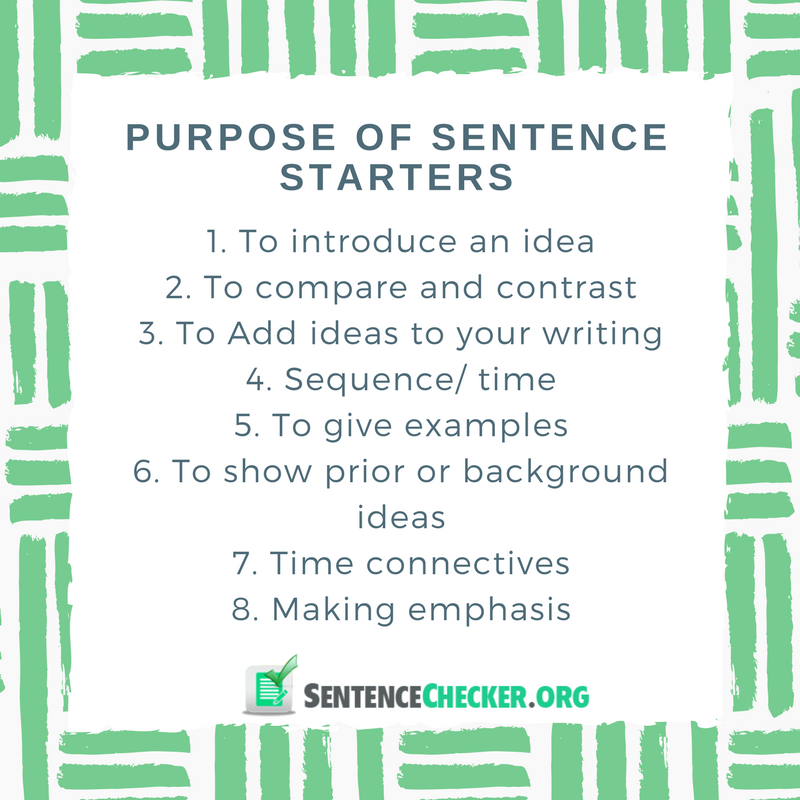 Use good sentence starters and grab the reader’s attention straight away!